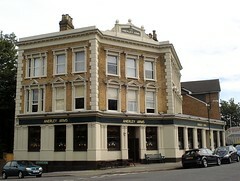 Samuel Smith's pub in Penge. It's very close to Anerley Station, on the northbound side of the tracks and fairly close to the (not always open) exit from the northbound platform. The pub is split into a number of areas inside. Entry is into the main bar area. To the right from here is a room with a pool table, while further back is another seating area and the spiral staircase down to the loos. Decor is traditional but not scruffy. There's a patterned carpet on the floor, and burgundy leather banquettes line the walls, flanked by iron-framed wooden-topped tables and hoop-backed wooden chairs. Dark wood panelling covers most of the walls, with dark green paint above. Windows are high in the walls, and half-frosted with Samuel Smith's lettering. A leaded glass gantry overhangs the bar, with snob screens at one end. Like all Sam Smith's pubs, they only offer Sam Smith's own products. They have no handpumps on the bar, but they do have the keg version of Old Brewery Bitter. When Kake visited on a Tuesday afternoon in August 2013, there was one other customer in. No music was playing. A pint of lime and soda was £1.04. According to a sign on the door as of August 2013, they don't take cards. Accessibility: A large step to get in. Toilets are down a spiral staircase, with a sturdy rail on one side. Last edited 2013-08-18 18:06:36 (version 5; diff). List all versions. Page last edited 2013-08-18 18:06:36 (version 5).